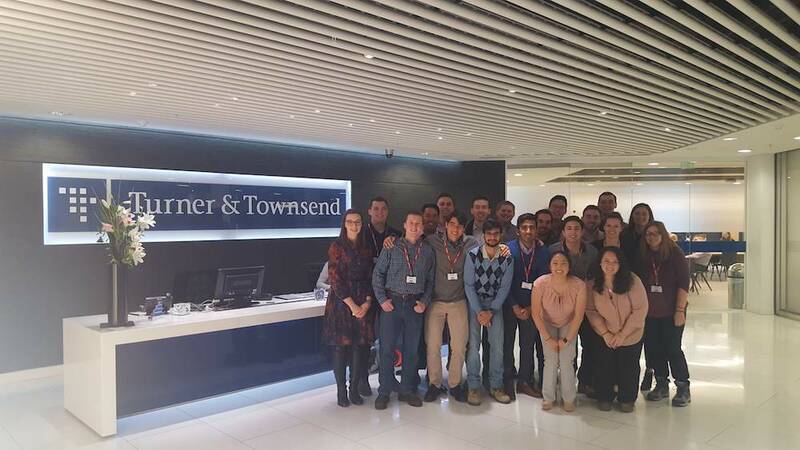 In the morning, we were invited to the London office of Turner and Townsend, where we were received by Catherine Kelly, one of the associate directors and head of procurement in cost estimating. Afterwards, we met Stephen Gibson, senior project manager in cost estimating and James Hamilton, director. As well as Thomasina Tomen, a manager in cost estimating, and Grace Bruce-Linton, assistant cost manager. 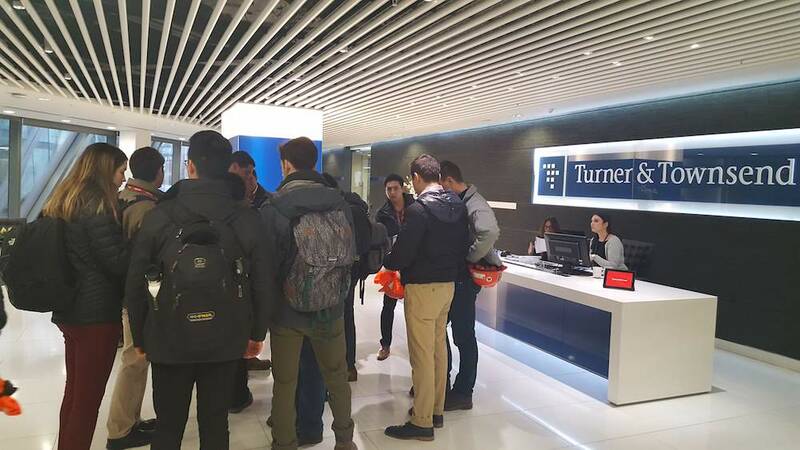 During our visit to Turner and Townsend’s office, we learned about the company’s footprint worldwide with their 108 offices and £508 million profit in the past year. We learned about their expert consulting from the oil and gas industry to residential infrastructure. They focus on asset rationalization, development and procurement management, cost and commercial management, life cycle costing, and project controls and performance. 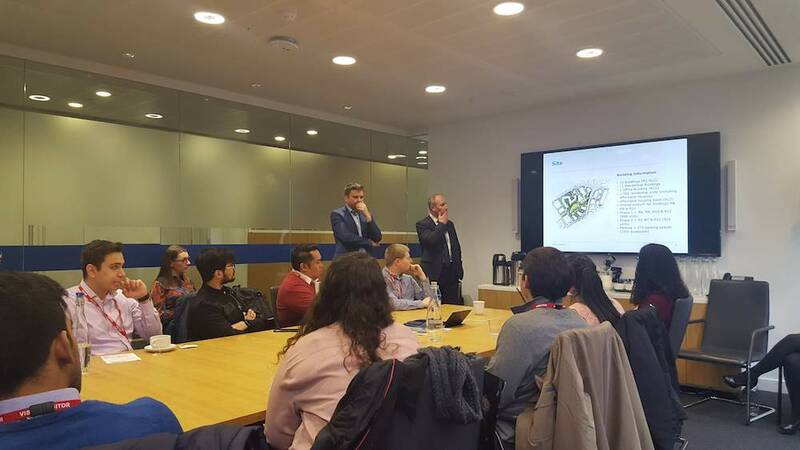 The project managers and directors of the London office explained the role of Turner and Townsend and the relationship between the client, the architects, engineers and general contractor. Primarily, Turner and Townsend provide a cost estimation of the whole project, considering inflation and change in material prices, before a final bid is sent out to contractors. In the United Kingdom, it is common to have several sub-packages within the bid package of a project to be bid for individually by a contractor. Therefore, the role of Turner and Townsend consulting is to provide a fairly accurate cost estimate of the project and procurement within a 95% accuracy. For instance, they were able to estimate £1.3 billion of cost using the software CostX, a globally compiled data for approximate cost estimates. Upon receiving the bids, Turner and Townsend compare its estimates to those of the contractors and use value engineering changes accordingly to improve procurement and cost efficiency. Turner and Townsend also have considering factors to their procurement. They had to provide fast delivery sales, consider competition, upkeep highest quality, and use market conditions. 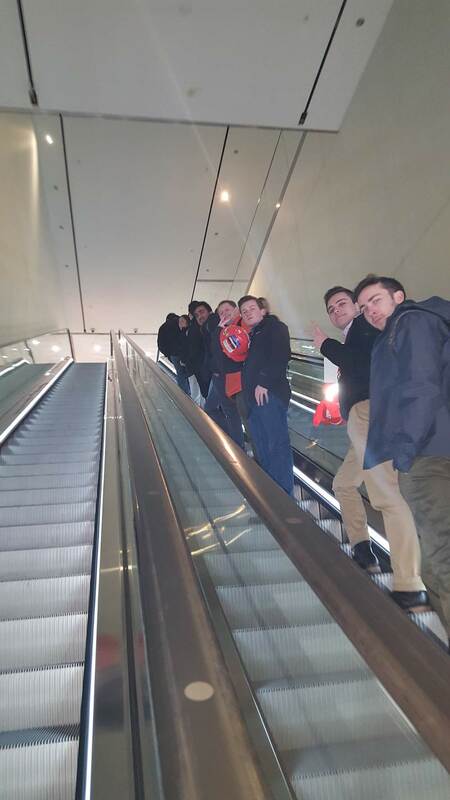 We were also introduced to some of the projects in which the company is currently working on. One of these sites is the work on Nine Elms Square. A 10.3 acres, with a total floor space of 2.3 million square feet and 1,915 units. It consists of 11 residential buildings and an office building, where 1,560 are residential units. Nine Elms Square will also have affordable housing available and 273 parking spaces. The second project introduced was the Battersea Power Station project, a renovation of the power plant and addition of residential infrastructure and underground subway station, right next to the Thames River. A £5 billion project, where Turner and Townsend used the construction management form of contract management. In addition, the power plant which is to be renovated will provide heating and cooling to the residences that will be constructed. The Battersea Power Station will provide state-of-the-art health, fitness and wellbeing facilities, art, culture and private bars, cafes and dining rooms. The third project was Damac Tower, still in construction. In total, there were six packages, further divided into subpackages for this project. With a total project cost of £240 million, Damac Tower will have 450 apartments, of which 20% of them are affordable housing which will provide a total floor space of 657,000 square feet. From our conversation with Turner and Townsend, we learned that managers embodied the current real estate market in London, where large real estate development companies from the Middle East and Asia develop residential and office buildings to be purchased by investors outside of the United Kingdom. Due to the situation in London, where there is a need of more housing space for Londoners, the prices of property have increased since the recession in 2008 and more space in London are being developed by foreign investors.